High on the Hog — Make that Sheep! “Memphis, Tennessee” evokes visions of dry rub baby backs. North Carolina makes mouths water for its pulled pork (whole hog in the eastern part of the state; pork shoulder in the west). Texas is ground zero for barbecued brisket, while the Pacific Northwest gave us the salmon roast. But Kentucky? If you’re like most Americans, you suspect they serve barbecue in Kentucky, but you’d probably be hard pressed to name a single Kentuckian barbecue specialty. This ignorance makes Wes Berry unhappy. 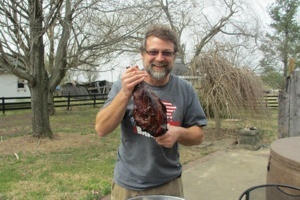 So the Western Kentucky University English professor and native son spent more than three years crisscrossing the Bluegrass State to report on the people and places that prepare its barbecue. The result: a lively, often humorous, always hunger-inducing 356-page love song to Kentucky barbecue called KY BBQ (University Press of Kentucky, 2013). Wes displays a leg of mutton he smoked at home on the Green Egg. So what’s so special about Kentucky? 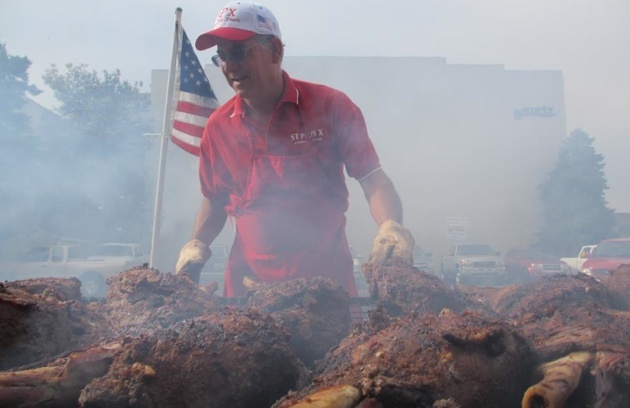 Well, for starters, it’s the only place in the world where you’ll find barbecued mutton (check out the mutton quarters being flipped at the 2012 Owensboro BBQ Fest, pictured at top) — that’s big gamy mature sheep, not delicately flavored lamb — sometimes smoked with sassafras, more commonly with hickory, and served with what may be the world’s only black barbecue sauce. Drop a pin on the Ohio River town of Owensboro and draw a 50 mile-radius around it. That’s where you can enjoy barbecued mutton and virtually nowhere else on the planet. Kentucky barbecue sauces vary, too, from the usual sweet tomato sauce to the vinegar and cayenne pepper sauces of Hickman County to the singular “dip” (black barbecue sauce) concocted from Worcestershire sauce and lemon juice and served with barbecued mutton in Christian County. 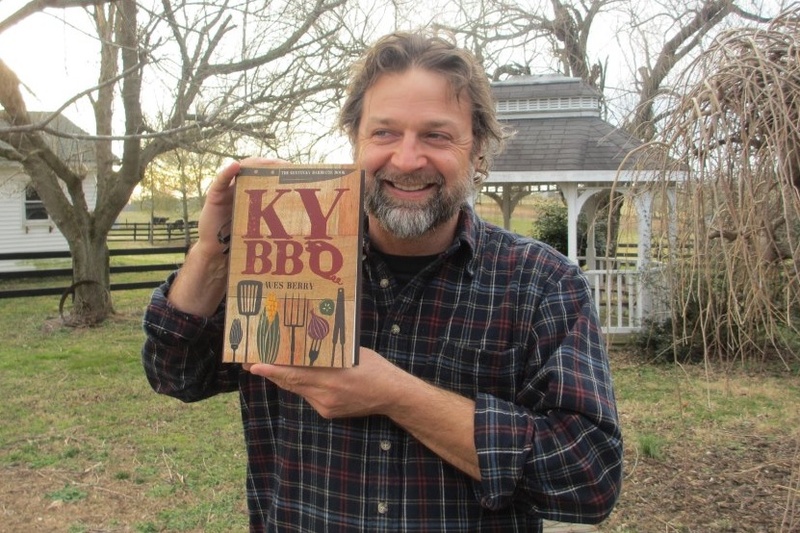 Part travelogue, part restaurant guide, part history; chock full of colorful characters, local food lore, BBQ joints worth a two-hour drive, and a smattering of authentic recipes to try at home, KY BBQ strikes the perfect tone between worshipfulness and irreverence. A must-read for any serious student of American barbecue. Wes Berry holds his recently published book. It took 3 years to make with 1000s of miles traveled, 100,000s calories ingested, 25 pounds gained, 167 BBQ joints and festivals visited, untold hours of writing, proofing, photo selection, and editing, and 100s of hours of interviews.